With something for all ages and interests, Lewis Ginter Botanical Garden is a place to learn about plants, to marvel at nature, to relax in a beautiful setting, to take gardening classes, or to have a wedding or business meeting. A wide variety of experiences are offered through our diverse gardens and facilities. No wonder Lewis Ginter Botanical Garden is consistently one of the most-visited attractions in the Richmond Region. 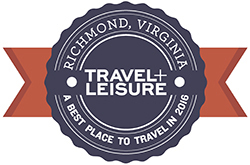 Richmond, VA was voted a best place to travel in 2016 by Travel+Leisure. Our Garden is wheelchair friendly. Learn more about visiting with a wheelchair and service animals. From breathtaking displays of spring blooms to our spectacular annual holiday light show, there is something to see at the Garden every season. There are many opportunities for children to discover, observe, and play at the Garden. Learn our top three things to do with children and get tips for an enjoyable visit. Catch up with friends over lunch at the Garden Café, attend a class or event together, stroll through the gardens, and more. The Garden is the perfect spot for a romantic stroll or a quiet moment alone with your special someone. Look for these friends from the wild who call Lewis Ginter Botanical Garden home. Lewis Ginter Botanical Garden anchors the northern end of Lakeside Avenue near the intersection with Hilliard Road in Henrico County. Along the way are numerous sites, shops and restaurants and there are many resources to help you plan your visit. There’s always something exciting happening at the Garden. Plan ahead! Enjoy a fabulous dining experience and pick up a memento from our Garden Shop. See what's in bloom, month by month. Spring, summer, winter and fall -- we have four seasons of interest. See the stories behind the plants. Membership means you can visit as often as you like and enjoy great discounts. An overview of the Garden to help plan your visit.